See Superheroes for What They Really Are! This month’s Hot Topic was contributed by Energize staff member, Lori Renner Larsson. I invited her to co-write it because she made an observation that I loved – and one that I haven’t seen written anywhere before. So we close out 2015 with a yet another example of unacknowledged volunteering, and a smile! We hope you celebrated International Volunteer Managers Day (IVMDay) on November 5th (and will also participate in International Volunteer Day on December 5th). 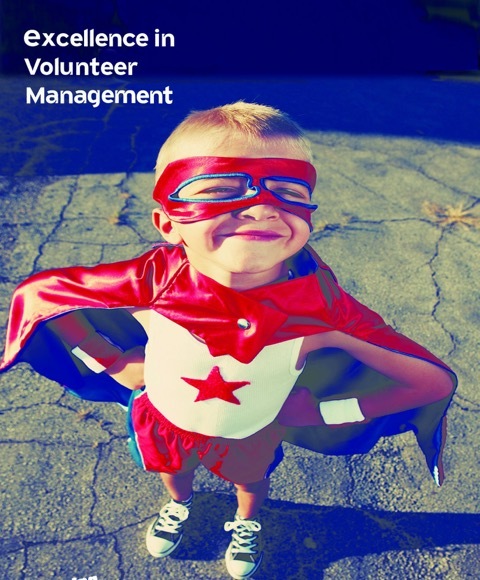 The theme for IVMDay 2015 was “Volunteer Managers: The Power behind Super Hero Volunteers.” It was a fun theme that begged for bright colors and fun images, and the field tackled it head on with some great graphics. The theme got us thinking. The folks behind IVMDay wanted to reinforce that volunteers are heroic: brave, strong, willing to jump in and help. And yes, volunteers do share a lot of characteristics with superheroes. But you know what? We think it’s really the reverse. Superheroes share a lot of characteristics with volunteers! Does Superman1 get paid to fly around Metropolis at all hours, tirelessly rescuing folks from the evil plans of Lex Luther? No. In fact, as Clark Kent, his paid job is as a journalist. Being a reporter is much more than a 40-hour-a-week affair. He’s got bylines to write and deadlines to meet. Superman is his persona—his VOLUNTEER persona. Same thing for Supergirl. In her secret identity in the comic books as Linda Lee Danvers, she holds a variety of jobs including television reporter, student counselor, and actress. In the new television series, Kara Danvers is a lackey assistant to a nasty media mogul. Her volunteer role, of course, is always to save people in danger. Does Batman get paid to patrol dark Gotham City all night? No. As Bruce Wayne, he’s never had to worry about money. He could easily hole up in his mansion all day and go to parties at night, while his trusty butler, Alfred, brings him cocktails and presses his tuxedo at regular intervals. His heroic alter ego, Batman, is a volunteer. Note, too, that they can be considered episodic or short-term volunteers, as they turn up when needed and then disappear until another incident attracts them. Just like the volunteers you work with, superheroes have various motivations behind their efforts. Bruce Wayne wants to rid Gotham City of evil like the men who killed his parents when he was a child. Wonder Woman’s quest for justice is fueled by desire to protect her Amazon homeland, which has often been linked to feminist ideologies. Iron Man is out to rectify the wrongs that he and his father committed in the name of doing business. Some of the best action stories result not when these characters work on their own, but when they join forces to achieve success and use their super powers in combination. The popular Justice League and the Avengers prove the power of collaboration. While the Hulk might be very good at holding up that toppling skyscraper, he may lack the stealthy skills the Black Widow can use to get all the citizens out of the building under the nose of the evil Ultron. Yet combined, their teamwork is perfect to save that little corner of the world. Well, maybe have some fun with it. How about using the analogy for targeted recruitment? 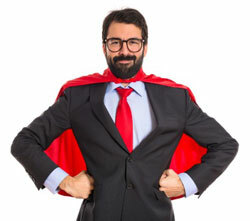 Recruit business people with the imagery of “leave the daily grind behind, grab your cape, and change the world…or at least fly over to help our kids!” Entice scientists with “you don’t need to be bitten by a super spider to transform into a hero….” Reach children with “you don’t have to wait to grow up to be a superhero to our residents.” And so on. Learn more about the lore of superheroes on Wikipedia – which traces the genre back to Robin Hood. Or see “My 100 Favourite Superheroes” to find other role models beyond Superman or Iron Man. Any other comparisons you can make between Superheroes and volunteers? How can we use this analogy to our advantage? 1 We acknowledge that the Superhero characters mentioned in this essay are copyrighted to DC and Marvel Comics. 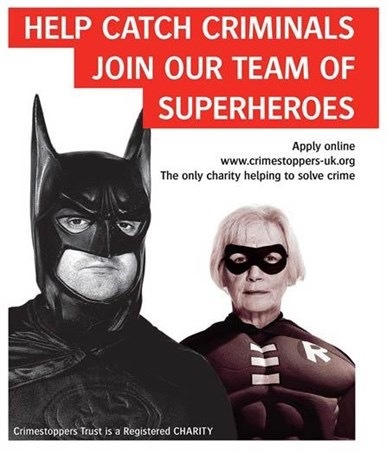 Thought you might appreciate the images below, one used by Crimestoppers here in the UK and the other was something we used at Volunteering England to promote an old training programme we had.